SEASIDE SUMMERHOUSE. Spacious Townhouse across from Pompano Joe's Restaurant, Short walk to the Beach, Townhouse #13. Summerhouse Town Home. King bed in master, 1 queen and 1 twin bed in guest room, Sleeper sofa, 2 1/2 baths. Sleeps up to 6. Enjoy the Gorgeous Pool -- So Clean and Inviting Welcome to Seaside Summerhouse -- View from upper balcony Comfortable Spacious Living Room with easy access to Ground Floor Outdoor Patio Enjoy your favorite shows and catch the news on the Living Room Flat Screen TV Relax in comfort after a day at the Beach Fully Equipped Kitchen with all you need to fix meals and snacks Comfortable casual dining with seating for 7 at the table and bar. Enjoy the convenience of a wet bar off the living room Convenient 1/2 bath on the main level downstairs. Spacious place to enjoy during your stay Plenty of comfortable seating and a large sleeper sofa for two King bed to be installed in March 2019 in Master Enjoy the Private bath in the Master Bedroom Each Bedroom has a Private Bath for the convenience of you and your guests. Queen bed and Twin bed in the 2nd Bedroom. Enjoy Convenience of Private Bath 2 Enjoy the Lovely Commons Grounds at Summerhouse Step out onto your Upstairs Balcony for breakfast Refreshing Community Pool for relaxing Plenty of poolside furniture for relaxing. SEASIDE SUMMERHOUSE is NEW to our program -- available Spring 2019. Take advantage of our 'New Property Special' rates for Spring Break and Summer. Book today and plan your 2019 spring break and summer vacation now!! We are excited to be able to offer this property now to our Coastline Condos guests. We know you will find this large Summerhouse townhome comfortable and surprisingly convenient to the beach. 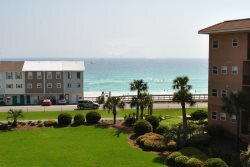 This roomy and comfortable 2 bedroom town home -- Seaside Summerhouse -- is located in the Summerhouse Townhome Community at Miramar Beach, Destin FL. 5 minute walk to the beach, 20 steps from the pool. Quiet location with front and back patio and 2nd floor balcony at the master bedroom. 2 assigned parking spaces right by the front door. Book your stay at Seaside Summerhouse where one large family or 2 families or 2 couples can vacation at the beach together with plenty of room to spare! This roomy and comfortable townhome is approximately 2 blocks from the nearest beach access. Take a 5 minute stroll to the beach where you can either rent a beach service (2 chairs/1 umbrella) in season at $40 or bring your own beach furniture and set up on the beach for a day in the sun! A friendly front porch welcomes you to this beautifully decorated town home. Upstairs, you will find two Master Bedrooms -- a King Bed in one, queen and one twin in the other and a private bathroom for each Master. A sleeper sofa on the main floor compliments the sleeping arrangements to sleep 6 comfortably. For convenience, there is a half bath on the main floor. Stroll out onto the private balcony from the upstairs Master bedroom to relax with your first cup of coffee in the early morning hours. The living room also offers a private patio just steps from the neighborhood pool. The kidney shaped pool is just off the back of the unit.. You will find laundry facilities in this nearby area. Clean and fresh linens are installed on all beds and in baths, so you are ready to begin enjoying Seaside Summerhouse the minute you arrive! Free high speed wireless internet is yours, so you can surf the net and shop, or catch up on the news. The kitchen is perfect for preparing meals, if you decide to dine in after a fun day at the beach.This roomy kitchen is equipped with lots of cabinets, including a custom designed, family sized pantry to store your goodies. All full sized appliances, plenty of pots and pans, dinnerware and silverware. Keurig coffee maker and a regular coffee maker are both available for your use. You are only a short stroll away from the glistening waters of the Gulf of Mexico. In addition, this livable town home is close to everything Destin has to offer. You are 2 short blocks from world famous Pompano Joes gulf front restaurant. A quick drive will take you to area grocery stores. The Commons Mall and Grand Boulevard, are nearby, where you can treat the family to a movie at a spectacular theater. Visit Silver Sands Premium Outlet mall which offers huge discounts on designer goods. Just minutes away are go karts and the Big Kahuna Water Park if you wish to gather the family together to take a day off from the beach to have even more fun! Plan a great family getaway -- Reserve your vacation at Seaside Summerhouse today! Why choose this beautiful Town Home for your vacation? Perfect for 1 large family or 2 couples -- split the cost! A Keurig coffeemaker has been installed at this property. So bring your favorite K-Cups! A regular coffee maker is also available. Seaside Summerhouse is our newest addition to Coastline Condos in Destin FL! We welcome you to book this property and enjoy its close proximity to the beach. Private, yet in the middle of the beach atmosphere of Destin along famous Scenic Gulf Drive. Run, walk, bike on a special asphalt path along the 6 miles right next to the sand. Seaside Summerhouse is currently available for New Property Special rates for Spring 2019. Call us today at 423-899-3003 or book on Coastlinecondos.com.